My homemade Chocolate Pecan Biscotti is crunchy, flavorful and perfect with a cup of coffee! Before I went on vacation last week I enjoyed a 3 day baking marathon and I’m happy to say 99.9% of the recipes I tested were a success! I have so much yumminess coming for you this week. In the very near future you’ll be feasting your eyes on cookies, pie, macaroni and cheese, and more CAKE. But first: biscotti! 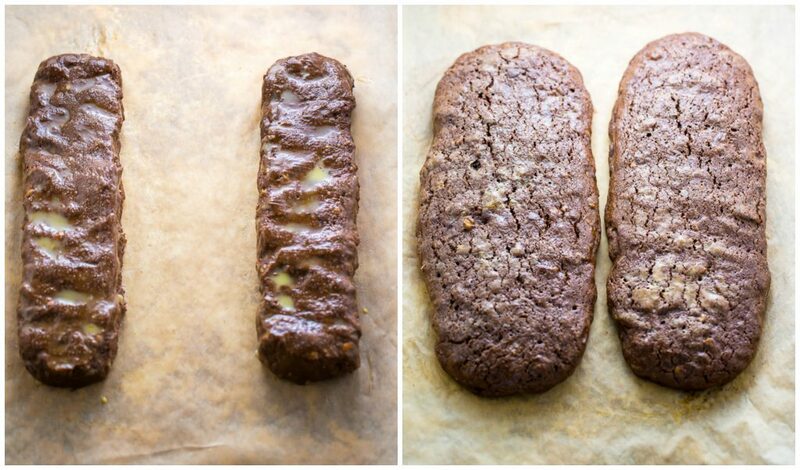 On a scale of 1 to 10 how familiar with biscotti are you?? Have you made it before? Bought it before? Eaten it before? Originating in Italy, the term “biscotti” comes from the Latin word biscoctus, meaning “twice baked”. 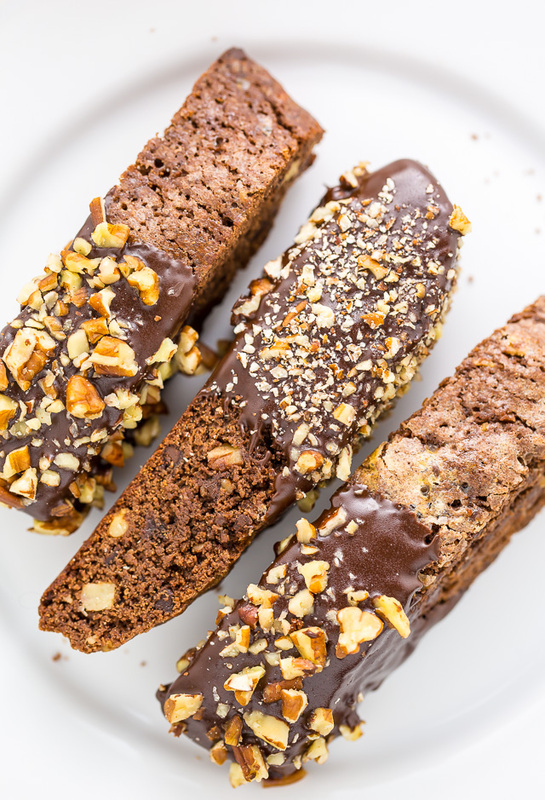 The biscotti is first baked in a log, then sliced and baked again. This double baking process makes the cookies dry, crunchy, and ideal for dipping in coffee, tea, hot cocoa, wine, or liquor. Although biscotti is traditionally almond flavored, these days you can find (and make) an endless variety of flavors. The dry and sturdy nature of biscotti makes them a great cookie to bake ahead of time or mail to loved ones. The trickiest part about making homemade biscotti is handling the dough. It’s soft, sticky and can be straight up stressful to work with. I advise working with it quickly, with slightly damp hands, and plenty of flour nearby. Try to mold the dough into the log shapes as fast and efficiently as possible. Try to touch the touch as little as possible. If you own a bench knife or pastry scraper you may also want to keep them at arm length. 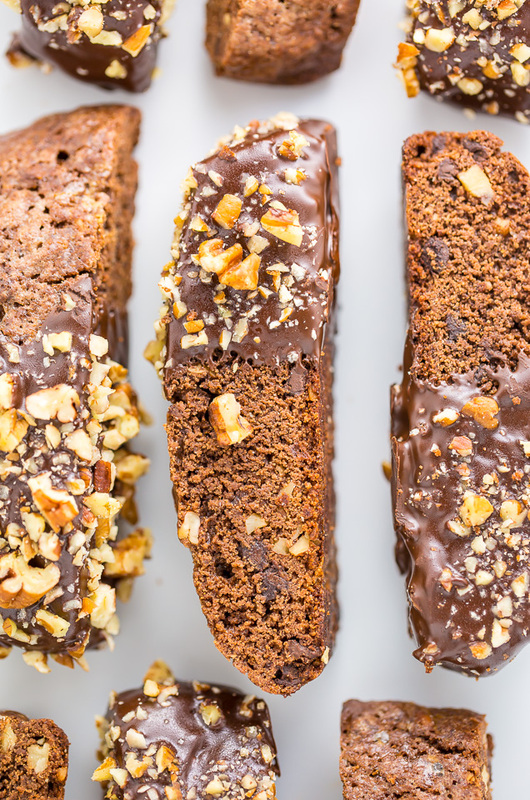 This recipe yields American-style biscotti, meaning while they are supremely crunchy they are not rock hard like their authentic Italian counterparts. Don’t forget to reduce your oven temperature right after the first bake is finished. The logs will cool for 25 minutes before getting sliced and baked again, which is the perfect amount of time for your oven to cool down before the second bake. You may use toasted pecans or raw pecans, but personally I find toasted pecans yield more delicious results. You may also use salted or unsalted pecans… both are yummy! Don’t like pecans? Use an equal amount of almonds, pistachios, walnuts, or even peanuts! Choose a quality chocolate you know melts well and tastes delicious. I used semi-sweet, but feel free to use dark chocolate or milk chocolate. Just be sure you don’t use chocolate chips! 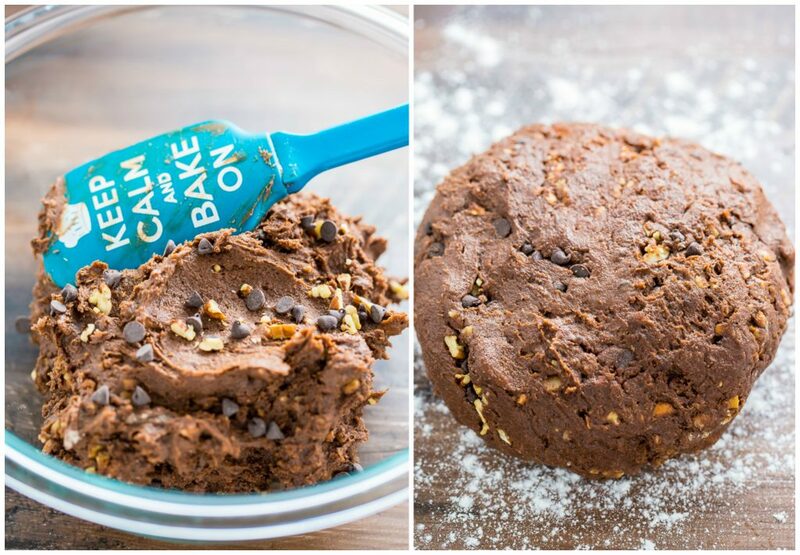 Speaking of chocolate chips, this recipe calls for mini chocolate chips in the dough. If you cannot find mini chocolate chips, you may sub an equal amount of finely chopped chocolate instead. Be sure the biscotti cookies have completely cooled before you dip them in the chocolate. Sprinkle the pecans on the wet chocolate RIGHT away to ensure they all stick. Since this step can be messy, you may want to do it over a newspaper lined table or your sink. 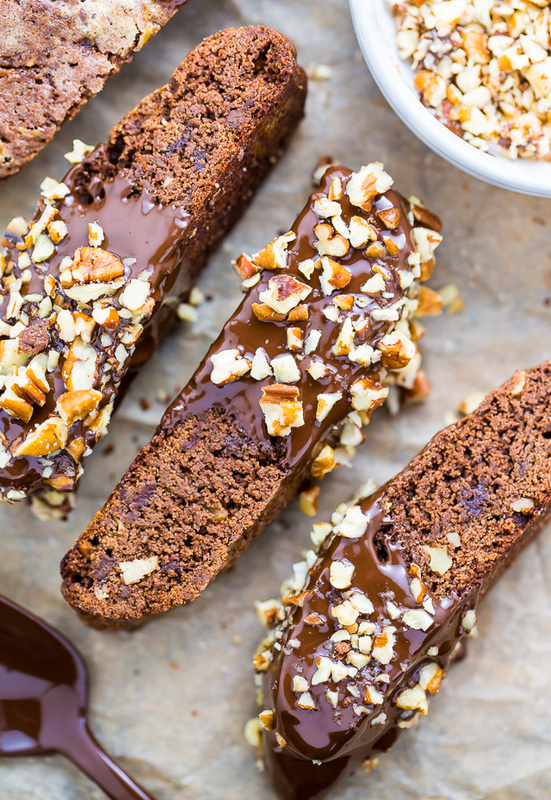 Chocolate Pecan Biscotti makes wonderful homemade gifts! The cookies will stay fresh and delicious for up to two weeks when stored in an airtight container, making them perfect for shipping or make ahead needs. You may also store them – minus the chocolate glaze – for 2 in the freezer. Just be sure they’re in an air-tight container! 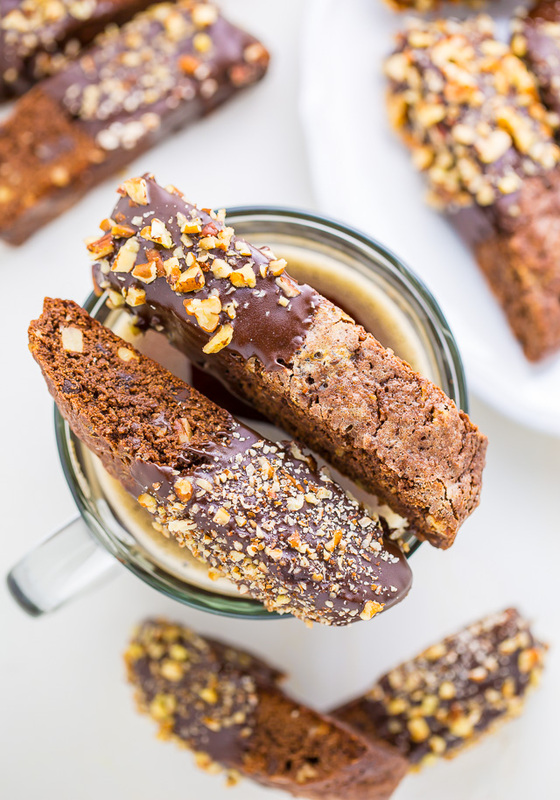 Sweet and crunchy Chocolate Pecan Biscotti is perfect for breakfast, dessert, or your next cookie exchange! In a large bowl add the flour, cocoa powder, baking powder, and salt; whisk well to combine and set aside. In a the bowl of a stand mixer fitted with the paddle attachment, or in a large bowl using a handheld electric mixer, beat the butter and sugar on medium speed until combined; about 1 minute. Add in the eggs, one at a time, beating well after each addition. Reduce the mixer speed to low and gradually add in the flour mixture, mixing until just combined. Add pecans and mini chocolate chips and mix until combined. Be sure not to over mix here! Lightly flour a clean work surface. Scrape the dough out onto the prepared work space (it will be very sticky!) and gather it into a ball. Press the ball into a round, flat disk, then divide the dough in half. Shape each half into a 12-inch log, adding a little bit more flour if needed. Place the logs, 4 inches apart, on prepared baking sheet. Using the palm of your hand, gently press down on the logs and flatten them until they're about 2 inches wide. Brush the top of each log with a little egg wash and sprinkle with sugar. Place the baking sheet in the preheated oven and bake for 25 to 30 minutes, or until the top is firm, shiny, and springs back when lightly touched. Place the baking sheet on a wire rack and cool for 25 minutes. In the meantime, reduce the oven temperature to 250 degrees (F). Once the 25 minutes are up, gently slide a metal spatula under each log to help loosen it from the parchment paper. Transfer the logs to a large cutting board. Using a serrated knife, slice the logs into diagonal 3/4 inch slices. Arrange the slices back on the parchment paper lined baking sheet, placing them cut side down and 1 inch apart. Bake for 25 minutes, or until dry and firm. Transfer the biscotti to a wire rack. Cool completely before dipping in chocolate. In a small bowl combine the egg and water; beat well. Follow instructions above. Place the chopped chocolate in a medium-sized microwave safe bowl. Melt the chocolate in the microwave, on low power, in 15 second increments, stirring after each increment, until completely melted; whisk smooth. If you do not own a microwave, you may do the previous step on the stove top using a double boiler. 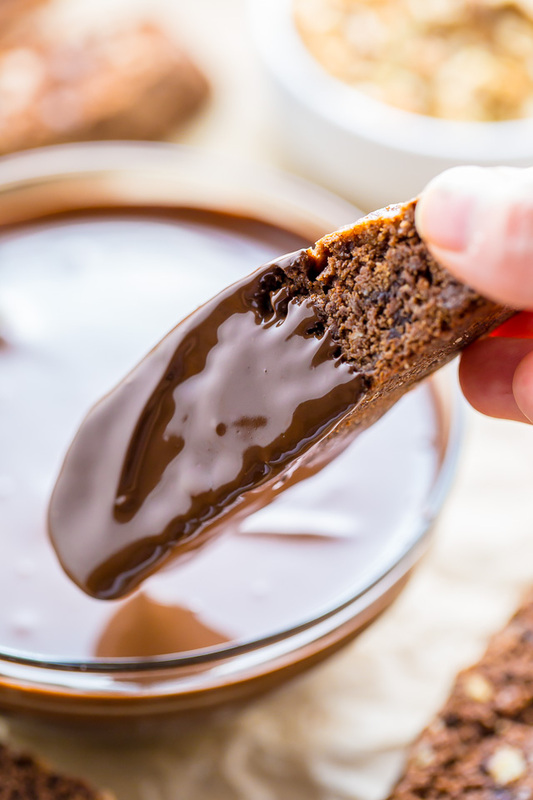 Once cooled, carefully dip one side of a biscotti into the melted chocolate, allowing excess chocolate to drip back into the bowl before immediately sprinkling it with pecan bits and placing it back on the parchment paper lined baking sheet. Repeat with all biscotti cookies. Once all cookies have been dipped, place the baking sheet in the fridge for 30 to 45 minutes, or until the chocolate has set. Biscotti will stay fresh, when stored in an airtight container, for up to 2 weeks. 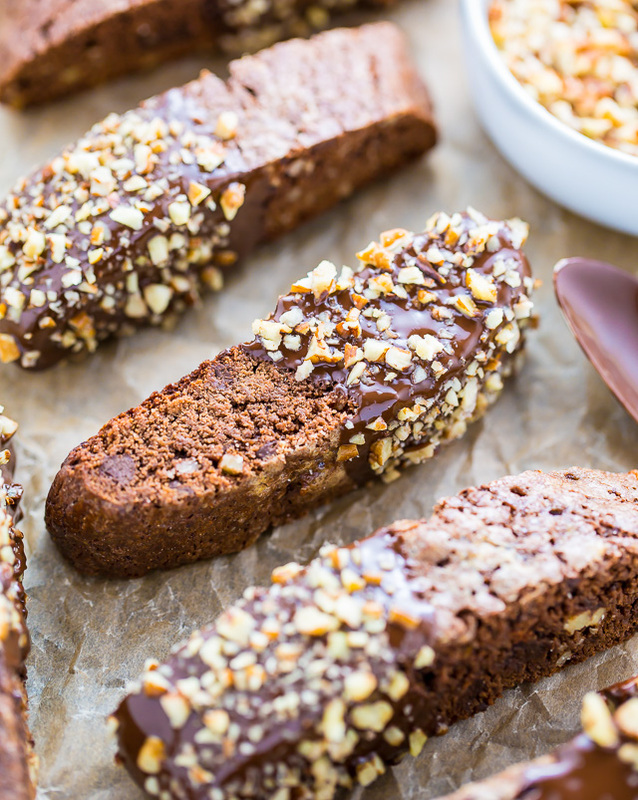 Biscotti may be frozen, without the chocolate glaze, for up to 2 months. This looks awesomely delicious… can’t wait to try it soon. Can’t wait to hear how they turn out, Kat! Can i subsitite the butter with margarine? Hi Elf. I have not tried making this recipe with margarine so I cannot say if it would work. For best results I do recommend using butter. They look amazing! Must be very addictive! This looks great. Unfrotunately, I can not have windows down with a breeze–it is 100 degrees here! These look amazing! Gorgeous photography too! Thank you so much, Lane & Holly! These are gorgeous! Will try them very soon! Can’t wait to hear how they turn out, Anna! I made these but after the first bake they were still a little gooey in the center, so the second bake I left them in for an hour and the came out perfect. Should I extend the time for the first bake and if so by how much? I also have a convection oven so I feel that it should have cooked quicker if anything. I love the recipe next time I want to try hazelnuts!